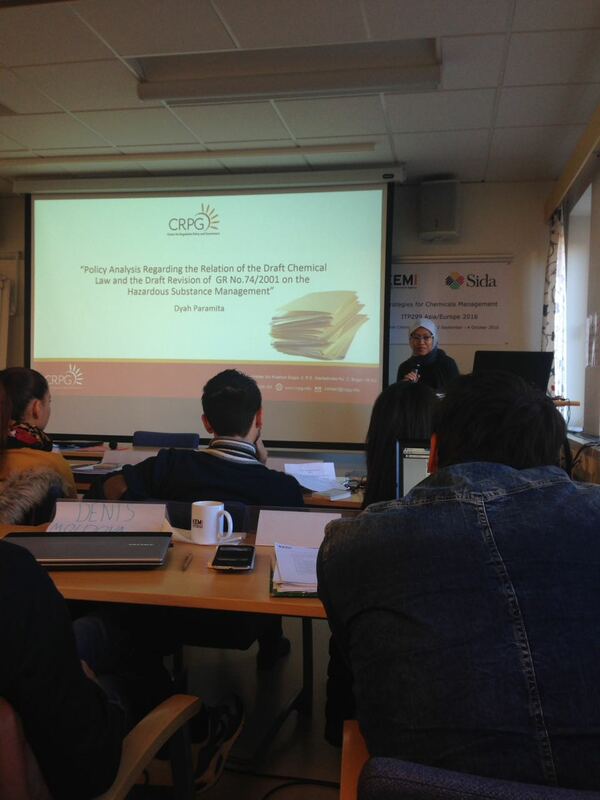 A CRPG researcher, Dyah Paramita, was selected among 29 other participants from Europe and Asia to be funded for a 3 week training on Strategies for Chemical Management conducted by Swedish Chemical Agency on behalf of the Swedish International Development Cooperation Agency (SIDA). In this program, the participants have learned and discussed several issues such as the importance of chemical management, the use of chemicals, hazard assessment and communication, exposure and risk assessments, risk management, law enforcement, and national development of chemical management. In this regards, CRPG develops an action plan to conduct a policy analysis regarding the draft of chemical law and draft revision of the Government Regulation No. 74/2001 on the Hazardous and Toxic Substance Management. The program includes visits to the Swedish Toxicology Science Research Center (Swetox), the Swedish National Food Agency, and the City of Stockholm Environment and Health Administration.